Enough. Or perhaps too much. It’s been a weekend that has highlighted some of the baser instincts present in our society, hasn’t it? While so many of us want to believe that we as a country are better than this and are achieving our ideals, events like Charlottesville provide an incredibly harsh reminder that we aren’t even close yet. I’m going to challenge you and tell you that this is about your city, your state, your community and that there is PLENTY that you can do. Reading the news, seeing the remarkable photos from Charlottesville, I’m using this as an opportunity to double down on my commitment to peace with justice and inclusion, and trying to not just provide lip service. We have GOT to move from words to deeds, friends. Or, as you’ve heard me say more than once in this space, we must #lovelouder. While you need to do what works best for you, here’s what I’m doing. I sent yet another contribution yesterday to the Southern Poverty Law Center. The SPLC was founded in 1971 and is doing some of the most important work today on civil rights FOR ALL. I hope that you will familiarize yourself with their work and that you will consider providing them with financial support. What they are doing makes a real difference and is so critical in a time when hate crimes and racism are so prominent. I’m speaking up. Yes, I know, y’all are used to me saying something when people are unkind and unfair. I’m going to be even more tuned in to comments that show bias…and I’ll be letting people know that’s not acceptable. I’m educating myself and my community. Earlier this year I did a pretty good job sharing #TuesdayTeachings on Twitter, which were items that provided more understanding of the underpinnings of various forms of discrimination. I’m recommitting myself to learning more and to sharing what I learn with you- and I’m trying my VERY best to get that information from members of the communities experiencing discrimination. I’m looking at my circle of friends for diversity and inclusion. I like to believe that my circle of friends is pretty diverse- immigrants, POC, LGBT are all well represented. But I’m looking again to see how I can expand my circle, and I’m seeking guidance from those friends on how to be more inclusive both personally and professionally. I’m listening. While I may not agree with or understand everything that people put in front of me, I will do my best to respectfully hear them and learn from their experiences. Sometimes that is really, really challenging! I’m walking the walk. If you have seen me in action, you know that all of the above are more than words on a screen. One of the most important ways that we can influence those around us is role modeling the behaviors we want to see in the world. I won’t say I get it just right every single day because, as I have said before, I don’t know what it’s like to be a member of many of the targeted communities. But I can make a good faith effort, I can ask for feedback from people I trust, and I can apologize when I mess up (and not make the same mistake twice). For those of us trying to be strong allies, these are important concepts. I’m going to challenge each of you who are part of my reader community to choose something- no matter how small you think it is- and make that your focus to #lovelouder this week. If you want to share in the comments or in social media your intention to make you more accountable, that’s great. If you want to write it down on a post-it and put it on your computer, that’s also great. Words and deeds that diminish any of us ultimately diminish all of us. Remember that, and please act accordingly. As promised, here’s the February reading round-up. What’s caught my eye recently? I was at SCCM two weeks ago, and would encourage anyone with an interest in critical care to read the Plenary Articles published in Critical Care Medicine. These presentations at the meeting were all nothing short of amazing. And… the Sepsis Guidelines have been updated (note: it’s mostly tweaks, little that’s entirely new). If you’re not a critical care doctor, this is still important and relevant if you want to provide evidence-based best care when your patient has something go wrong. In surgery we sometimes get to have conversations with patients and families when we don’t anticipate a completely smooth clinical course. I’ve been playing with this framework since Gretchen Schwarze came and talked to us about it last year, and I find it helpful. You might too. Here’s some background work (with more great work coming) from my colleague Chris Pannucci on Anti-Xa level monitoring and perioperative use of enoxaparin. Last year at the ASE meeting I was a little dismayed to find the frequency with which medical students use Wikipedia as a reference during the clerkship. This article provides some justification for simply embracing it and makes me question if we should have a Wikipedia “hackathon” during 2018 Surgery Education Week. 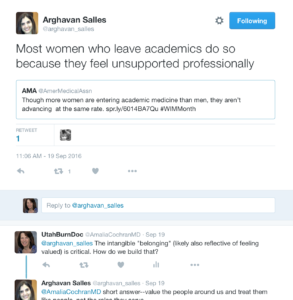 I’ve preached about the importance of allies for women in male-dominated fields before in this blog. Here’s another confirmatory article from HBR. Men, we really need your support, and if done right we can even benefit from your leadership. Last week I was involved in an email exchange with two colleagues (we’re working on a subversive project together…more on that eventually) when one of them pointed out that a 2017 meeting of a major surgical organization has exactly zero women scheduled as a keynote speaker. Yes, you read that right. Zero. This isn’t a a specialty organization I’m a member of because it doesn’t meet my clinical or professional development needs, but both of these colleagues are members. And while I know some of that organization’s higher echelon leadership fairly well from other organizations, I’m not really in a great position to point the issue out to them since I’m not a member. Fortunately, our third colleague involved in the Subversion Project is a man. Most importantly, he’s a man who does not hesitate to speak up about failure of inclusion, and he also happens to be a member (and leader) of the organization in question. He’s asking lots of questions about diversity and inclusion, and I made it a point to thank him for doing that tonight. This series of events was buttressed by an HBR piece last week on men who mentor women. While this particular instance is less about mentoring and more about “doing the right thing,” it’s behavior that tells me that this individual is also likely a remarkable mentor and sponsor to women surgeons. And he’s engaging in the first behavior identified in the HBR article, using his authority to change workplace culture. While he’s not in one of the BIG leadership changes to force change about inclusivity in the organization in question, he is using his voice to ask important questions and make sure that the issue isn’t ignored. He’s being an ally, and that’s something that none of us can underestimate the value of, even as we’re about to enter 2017. Patricia Numann has long used the phrase “enlightened man” to describe the allies who have helped to advance women in the surgical profession. 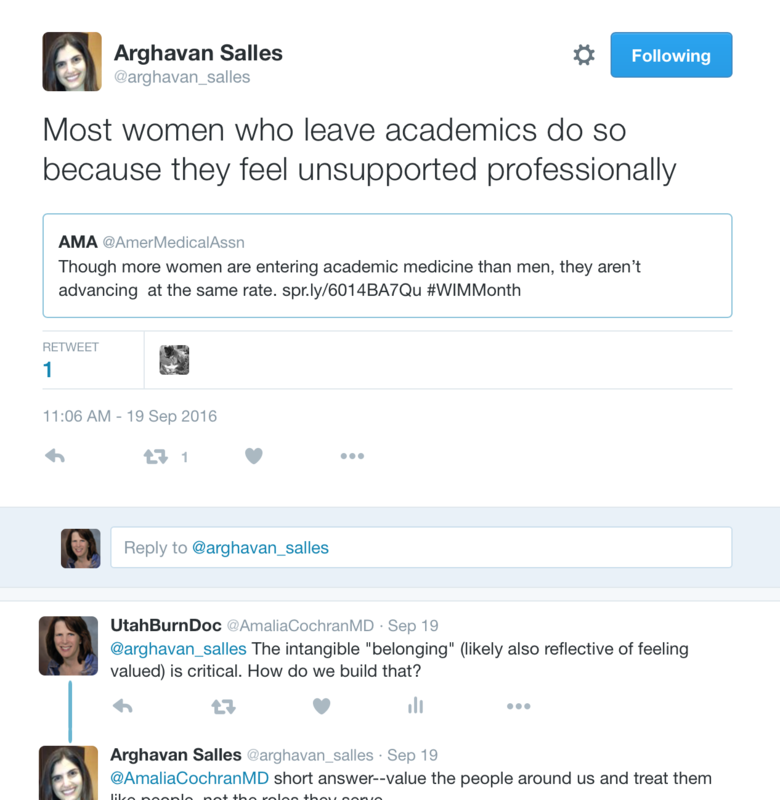 In interviews I did in 2014-2015 about barriers to academic careers, the preponderance of the mid-career and senior women surgeons I interviewed described at least one male mentor who was instrumental in their career development. Until we achieve a critical mass of women in academic surgery, meaning we’re 1/3 or more of those at the table, this isn’t going to change much in the absence of spectacular help. You know, the kind of help that raises its hand and says, “Hey, we can do better to represent our membership in general,” then gets to work making sure that actually happens. Many of us remember laughing at Al Franken’s Stuart Smalley character on Saturday Night Live; for those who don’t remember the skit, the character is focused on repeating positive affirmations (and it’s still worth a watch). If you think about when you’re at your absolute best, what thoughts are you having about yourself? Chances are that this is not when the word “loser” comes through your mind repeatedly, or when you’re wrestling with a case of impostor syndrome. Now, if you extend this to your team, what thoughts do you have when your team is performing at a crazy-amazing level? Again, I doubt that you’re thinking about how tired you are of Bob and Betty fighting, or what a poor lead nurse Billie Jo is. Admit it- when you recall situations in which there was great success, you tend to go positive with the things you think about. It immediately tells you what your and your team’s strengths are, and it gives you confidence to perform at a high level. Time for a confessional: As I thought about using strengths and success oriented self-talk, I had a moment of self-illumination. I realized that during the times when I have not been a good leader, when I’ve been petty and difficult, it has uniformly come from a place of insecurity. And what’s put me there? That little voice telling me that I’m not enough, that I don’t belong there, that I really can’t do this. Additional confession, or wisdom grown from my own lack of it: If I’ve learned any lessons in the last decade, one of the biggest ones is that people “feel” that insecurity and that sort of inner monologue. They know you’ve got doubts, and if you’re supposed to be leading them they’ll start to doubt themselves and the team too. It becomes a vicious cycle. That leader stands in stark contrast to the “I’ve got this, and we’ve got this” leader who instills confidence in the team, makes them more capable, and helps them to achieve at a higher level. Which leader do you want to be? And what are you telling yourself about your ability to be that leader? Opening confession: I’m writing this as much for me as I am for you, readers. I had intentions of writing about resilience today because it’s been a recurring theme for a bit. Instead, you’ll have to read about it next week. This morning as I was listening to the weekly dharma message from Susan Piver, her focus was on simplicity in our meditation. As I listened to her incredibly simple (and brief) message, I realized that as I go into a week that is always characterized by absolute pandemonium, simplicity is exactly what I need to focus on right now. If I’m 100% honest, simplicity has probably been a sub-theme for the last couple of weeks for me. I’ve noticed that I have unintentionally been laser-focused on getting some tasks (which may or may not have been procrastinated upon!) finished; many of them are tasks that involved things cluttering my house and my creative space. It felt really good to get those things done and get the associated “stuff” out of my way. So, simplicity. It seems like an oxymoron if you look at my schedule this week, particularly for the next 2-3 days. I’ve got multiple times that I’m supposed to be multiple places. Yes, I know that I haven’t been cloned (yet), which means I’m going to have to make thoughtful choices and then embrace them. Those choices will absolutely be based upon what is most meaningful to me, and if you’re with me this week you may see me making some tardy entries and early exits. I emphasize the issue about things being meaningful “to me” because that also means that I have time blocked into my schedule to run and for some yoga…because those things are meaningful to me (and, quite candidly, no one wants to be around me if they don’t happen). I can’t fix the fact that I have chosen these things that will make me intensely busy the next few days, but I can choose how to best manage that busyness. I can be present in the moment (another choice), I can turn off for a few minutes every day (even 5 minutes helps, right? ), and I can be grateful (this morning while walking Olivia I reminded myself, “You CHOSE this. And how fortunate you are to have been able to do so.”). Who’s with me? Let’s be simple together. 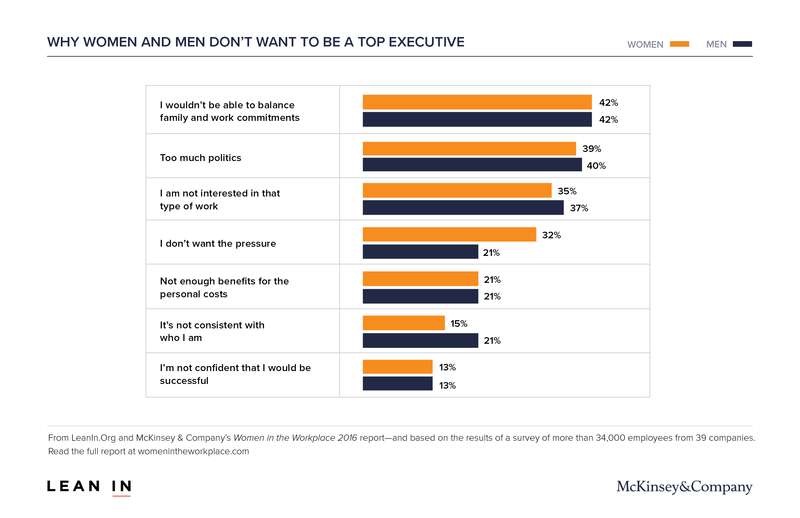 The McKinsey 2016 Women in the Workplace report was recently released; it’s taken me a bit of time to process the information in it. It’s complicated, and in the throes of a Presidential campaign that is rife with misogyny, it might even be a bit discouraging. We know in professional America, and in academic surgery, that a significant fall-off occurs in the number of women as leadership roles become more powerful. In academic surgery, we see it with the drop from 16% of Associate Professors to 9% of full Professors; we see it with the paucity of women in leadership roles in major organizations; we see it with the number of women who are department chairs (recognizing this number has improved dramatically even in the last year). 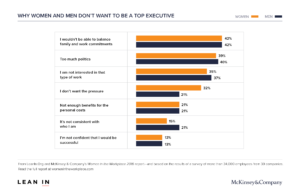 We know that women often simply don’t seek promotion to the highest levels, perhaps because work-life integration is more acutely present for women in our society. Perhaps its because we have an unconscious bias against ourselves that only allows us to take a chance on that “big” job once we’re 100% qualified (or, perhaps, more than 100% qualified). Or maybe, just maybe, it’s because we’re programmed to think of “power” and “ambition” as dirty concepts. They’re not ladylike, and therefore we don’t want to be in that top role because that would require us to be ambitious and it would require us to use our power. This week I saw an interesting complement to the idea of the the ambition gap, in which Anne-Marie Slaughter hypothesizes that women perceive ourselves as able to have a greater impact at the center of a “web” than at the top of a hierarchy. While her idea that women don’t understand the impact we can have at the top, it’s also plausible that we are so much more comfortable working collaboratively that the idea of having diffused impact through a network is what makes the most sense to us. What we may be overlooking is that we can use the same high-touch, collaborative skills when we’re in that “big” leader position, and use it to our advantage. Maybe it’s time for us to change our thinking and stop being one of our obstacles (because heaven knows there are plenty without self-sabotage). Maybe we need to realize that it’s okay to dream big, and that it’s okay to start looking even when we don’t think we’re quite ready. Maybe, ladies, it’s time to leap- and our nets really will appear. It’s a win for each of us who is ready to do so, and it’s a bigger win for those coming after us as they see our courage, our commitment, and our strength. As you can tell, I moved the needle a bit in this discussion, doing so based both on data I have (I’m working on the manuscript, I promise!) and anecdotes from talking to surgeons who are struggling with career advancement. When I talk to friends who are struggling in their career, be it in academic surgery or another profession, I consistently hear two integrally related ideas from them. One is that they truly don’t feel like the belong where they are; they aren’t aligned with their company or institution for some reason, be it an issue of core values or goals. And as part of not belonging, I find that many of them try desperately to fit in and often feeling like a round peg in a square hole. Those attempts at conformity are, if nothing, destructive to both their satisfaction and their achievement. We see this sense of exclusion, of not fitting in around gender in male-dominated fields like engineering (full disclosure- my best friend is a woman engineer, and she may have more awful gender bias stories than I do, though she has also stuck it out and is incredibly successful). We see it in policing around organizational culture and institutional racism. Ironically, we could use social accountability, in this instance playing on leader’s interests in fitting in, as a way to improve diversity and inclusion. As leaders, we have to embrace that it’s not fair of us to try to fit round pegs into square holes; when we’re recruiting, we need to have the courage to tell someone that their interests or ethos may not be a good fit for our organization so that we don’t set them up for failure. As leaders, we also have a responsibility to create a culture that is inclusive and that can accept differences. I understand that resource limitations mean that every department cannot have expertise and resources in every area that might be relevant for a junior faculty member’s career development. The time to think about that is during recruitment-do we have it or can we build it for them- rather than once the new faculty member shows up only to realize they won’t be able to do what they view as meaningful work. They’ll be forced to try to fit in, rather than to belong, because they’re always going to have a sense that what they do doesn’t have value where they are. I want to also be clear that I don’t expect every single academic department to be a cookie cutter of other departments. That would be boring, and wouldn’t be good for our patients or our profession. We should institutionally embrace our strengths and capitalize on those and recruit appropriately. If someone wants to be a public health researcher and trauma surgeon, we should support that person going to the best place to fulfill both of those professional goals. If someone wants to be a surgical educator and a vascular surgeon, we should do the same. What matters is that there is a “home” for everyone who wants to be here within the house of academic surgery (yes, we need to redefine what being an academic surgeon means! ), and that we find them that place where they can thrive and belong. It’s time to move past fitting in. Our profession deserves that, and so do our junior colleagues who have plenty of amazing ideas. This piece in WSJ this week generated quite a bit of conversation on Twitter within my circles. You see, at times there is still this culture around the idea of calling for help being a sign of weakness. I still know of too many faculty (because more than 1 is too many) who have reputations for being bears when called in the middle of the night- a reputation I consider only slightly more favorable than those who are known for ignoring calls and pages outright. And I still remember what it can be like to be on the resident end of those phone calls; you know that you’ll get berated for calling, but you also know that you’ll be in even deeper trouble if you don’t. An important piece that extends beyond training is by calling for help when we’re concerned that we are getting into a bad situation. When I was freshly out of training, I didn’t think twice about calling my senior partner to look at things with me in the OR. I can only think of once the he scrubbed in; more often he gave me someone to bounce ideas off of, and he validated that I really did know what I’m doing. In the last 6 months, I’ve called one of my partners for help in the OR when I had unanticipated and impressive bleeding while doing a trach (he scrubbed, we fixed the problem together, patient did okay), and that same partner called me to look at a patient’s wounds with him intraopratively when he had concerns. I recognize that this is part of the culture that we have within our practice group, and I’m grateful for it; it supports us in making the best decisions for our patients and providing them with the very best care possible. And, as was astutely pointed out by a former student who is now a surgical attending, we’re providing good role modeling for our residents and students that calling for help is, in fact, the right thing to do, and that you’re never too senior or too experienced to invite someone else in to a complex situation. If you think you should call, call.